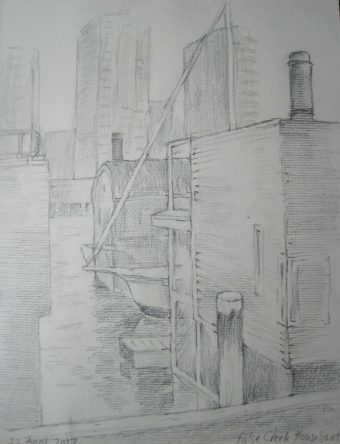 This picture was drawn outdoors on 22 April as part of an Urban Sketchers Meetup at Granville Island. Choosing a gap between houseboats rather than a single individual one, I used a soft graphite pencil (9B) on laid paper, varying the pressure to create darker or lighter tone. The triangle between the mooring post and the two chimneys appealed to me, as well as the prow of the boat protruding into the gap. This entry was posted in Uncategorized on April 25, 2017 by Graham Good.